One tool in the Epoch Calc Excel applet (and in archaeogeodesy.xls) is eclipse calc, the eclipse calculator. A variety of features make eclipse calculations easy in eclipse calc. The spreadsheet cells users manipulate are distinguished with white background color and you need only input multiples of orbits and periods to compare the number of days in different eclipse cycles. The Excel applet also features Lookup menus to provide quick reference to numerical variables and the AeGeo terms or codes. 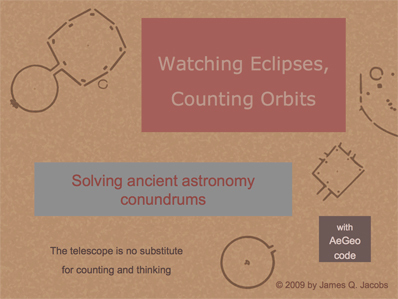 AeGeo is an astrogeodetic programming code with intuitive, easy-to-learn astronomical shorthand. Input or lookup any two combined code terms (Table 1) to find or utilize the value, for example combine "l" (lunar orbit) and "r" (rotation) to utilize the value of lunar orbit per rotation. For ease of use, drop-downs are labeled "menu" and input cells are labeled "input". An epoch selector automatically adjusts the values of astronomical contants and obliquity of the ecliptic. You can add new epoch variables or input any year you choose. Altering the epoch selection will impact the numerical drop-down menu if the selected value is subject to changing temporally. A variety of epochs associated with ancient cultures are pre-programmed in the epoch worksheet, where you can add others. The eclipse calculator features are in the calc worksheet. The temporal selector is in the v2009 worksheet, where correlated astronomical constant values display along with lookup drop-down menus. Some lookups support direct input of code and display the value and the code term for easy verification. All code terms are available in a single table in the aegeo worksheet. The Excel name feature in the formula bar selects the entire table to facilitate sorting. (I prefer not to create macros because some users, for security reasons, do not download files with macros.) The "aegeo" name selects the entire code table. Other named ranges support the lookup and drop-down menu functions. In the math calc area you can input both codes and multiples. Adjacent unused cells in the worksheets allow custom calculations. A variety of other features are also provided, including a logarithm calculator, a Maya Long Count converter, planetary data with a code lookup, and other conversion tools. Formuls for all the constants are displayed in the formulas worksheet. Enjoy the applet. Feedback appreciated. Expect future updates in archaeogeodesy.xls only. ©2012 by James Q. Jacobs. All rights reserved. Your comments, etc. are appreciated: Contact.